How do you approach each project so there's a comprehensive contextual experience? I study the exhibit space and how people move through it, the lighting (both natural and artificial), and the sound (ambient and music). I envision the experience of entering and first seeing the pictures, and then moving in for a closer look. I then try to create an exhibit that has a strong emotional and visual presence and also enhances the space. How did you approach the project for Local including the masterful grid display system? 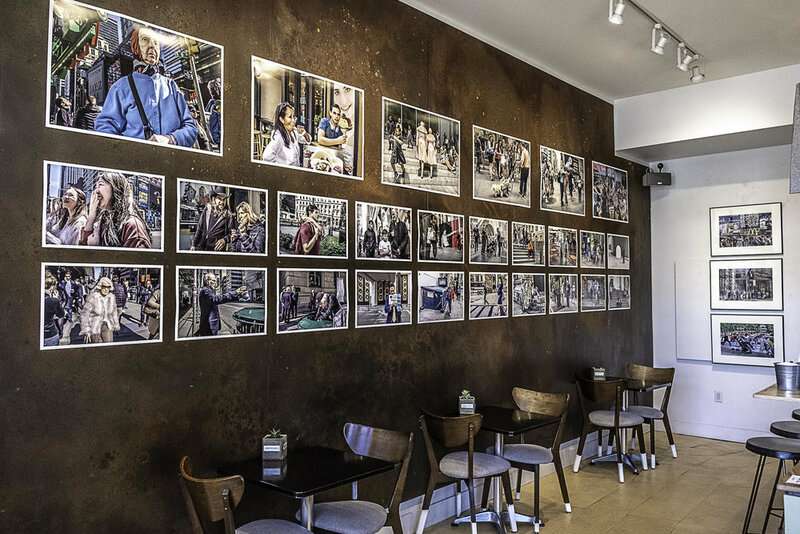 The large patina metal panels and high ceiling allowed me to create a show that is relatively dense with images and includes large scale (20" x 30") pictures mounted high that can be easily seen because of their size. By carefully and precisely arranging the photos, a grid was created which seems appropriate for pictures taken on the grid of streets in New York City. You have a super intimate relationship with NYC which is evident from the manner in which you capture a variety of moments. NYC is arguably the capital of the world so no surprise in selecting this market but what specific elements draw you in? I always feel fully alive when I'm in New York City and I look for that energy in the people and situations around me. Of the current collection of images @ Local, which one brings you back for re-interpretation? I can't say there's one that I keep coming back to. They are all equally interesting to me. At what age did you begin your craft and what was the initial driver for you to consider photography as a path? I've loved photography all of my working life, most of which has been spent as an architect. There was no one moment when I became a street photographer. It happened gradually, then gathered steam. Now street photography defines and nurtures me, and gives me a reason to get out of bed in the morning. Photography is an evolution, personal development as well as technology and equipment. Do you like where we are today and where photography is going or do you prefer a past time with arguably simpler option? My learning curve as a photographer was greatly accelerated by the transformation from film to digital, and the development of image processing software such as photoshop and light-room. It simply became much easier - and less expensive - to learn how to produce decent work. Technology doesn't produce fine art however. In order to do that, you're on your own. What's next on you journey? Is there a project that you are working on or working towards? My journey is street photography. I want to get better, to keep evolving as an artist and a person. What's your favorite coffee or tea beverage? Black coffee, room for half and half, sweetened slightly by stevia. How did you learn and hone your craft? After fifty years, I'm still learning and honing. I'd say the best way to do anything is to just do it: sit down or stand up and draw, pencil and paper, pen and ink, computer, or whatever tool you have on hand. You interact with so many pets and pet parents, what has been the biggest learning for you? I listen to what people say and draw the best drawing I can draw. I try not to intellectualize what I do. My philosophy is simple: draw the pet and make the owner happy, but NEVER compromise. Draw as if your drawing MUST stand the test of time. I don't aim for photo images, I aim for the best, simplest drawing I can draw. It's all about the drawing: pencil, ink, maybe a little watercolor, that's it. 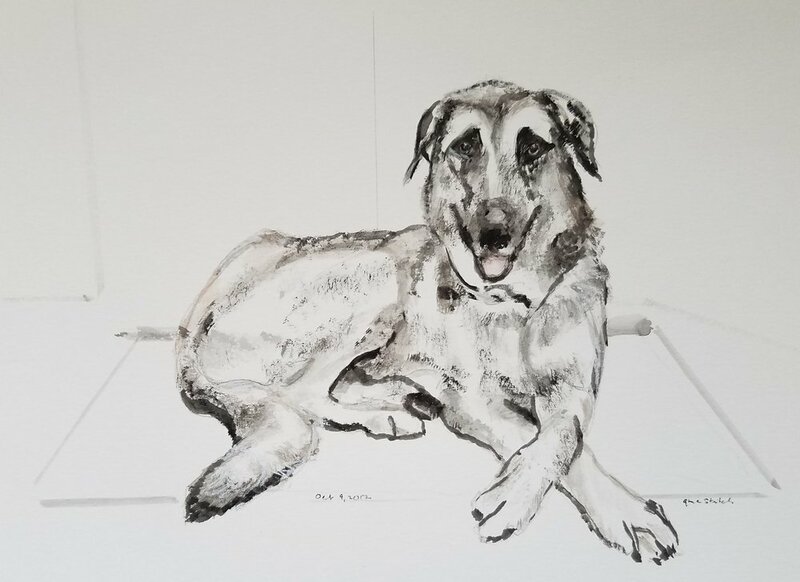 I've noted that pet sketches can come off extremely campy OR spot-on, with the artist being able to capture not just the image but the personality and character of the pet. Each of your sketches tells a different story and are so powerful, how do you approach each subject to extract that special something? Source material: the better the photo, the better the drawing. If I get a good photo, you get a good drawing. Are there any particular artists that have influenced your approach? Honestly, no, I'm into my sixth decade and am who I am. I don't try to be anyone else. I admire John Singer Sargent and many, mostly American artists. I admire the work ethic and business sense of Andy Warhol and I like the drawings of Al Hirschfeld, just to provide a few examples. Are they all commercial artists? Yes, but they were also extremely talented and intelligent and diligent. Do you have pets, if so - tell us about them? I have dozens and dozens, hundreds of pets, but they're all on paper. Tell us a bit about the images you have shared with us @ Local. The drawings on the magnetic wall are all originals. Some are oil pastels and ink, (but I mostly stopped using oil pastel because it's messy and smears), and the others are watercolor and ink. Some are based on professional photos, but some are just good cell-phone photos. Some are popular breeds, some are unknown breeds. 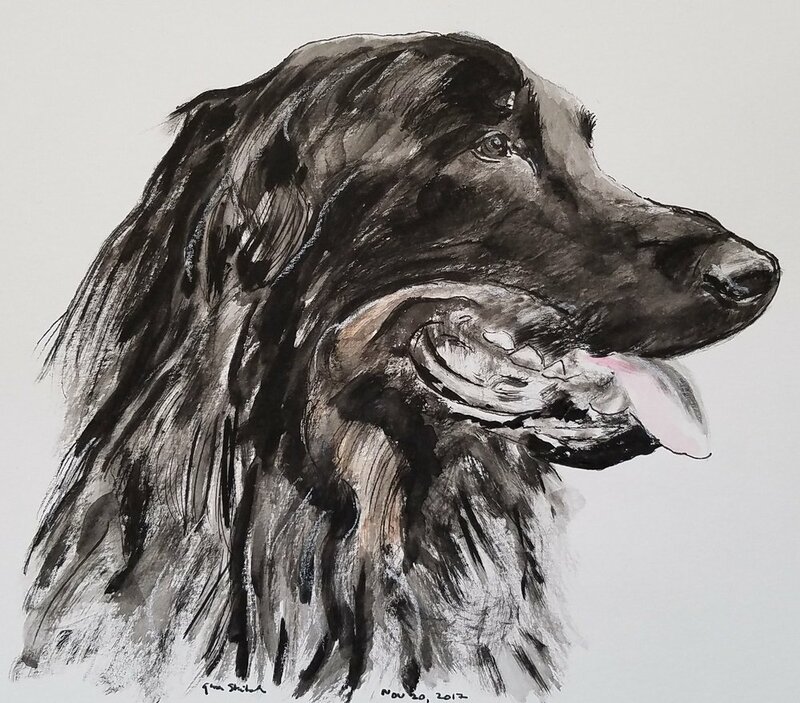 Some of my favorite drawings are mixed breeds. I used the drawings I used for a practical reason: it's what I had at hand. The drawings I don't have have been sold and the best artist is one who sells his or her work. What's the best way for you to work with clients? Phone call, in-person meetings, simply sharing a photograph? All I need is a good cell-phone photo emailed to me. I can work with a poor (hard copy) photo, too, and sometimes, maybe that's all a person has.